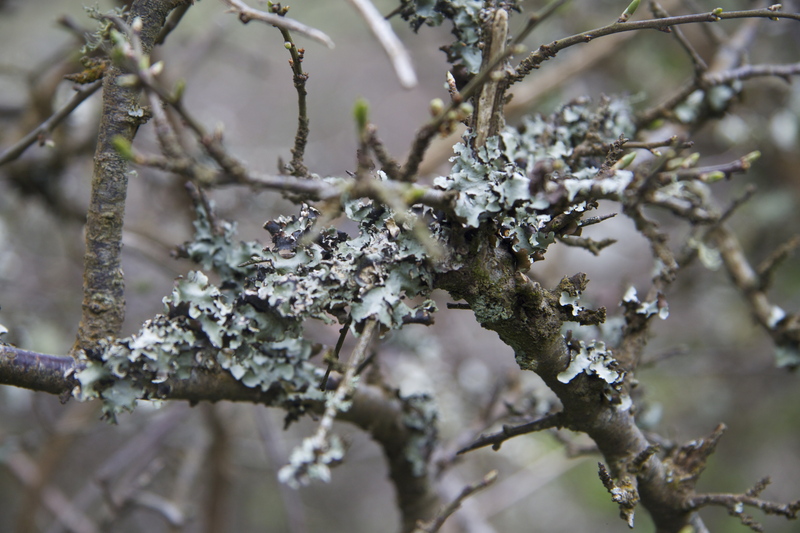 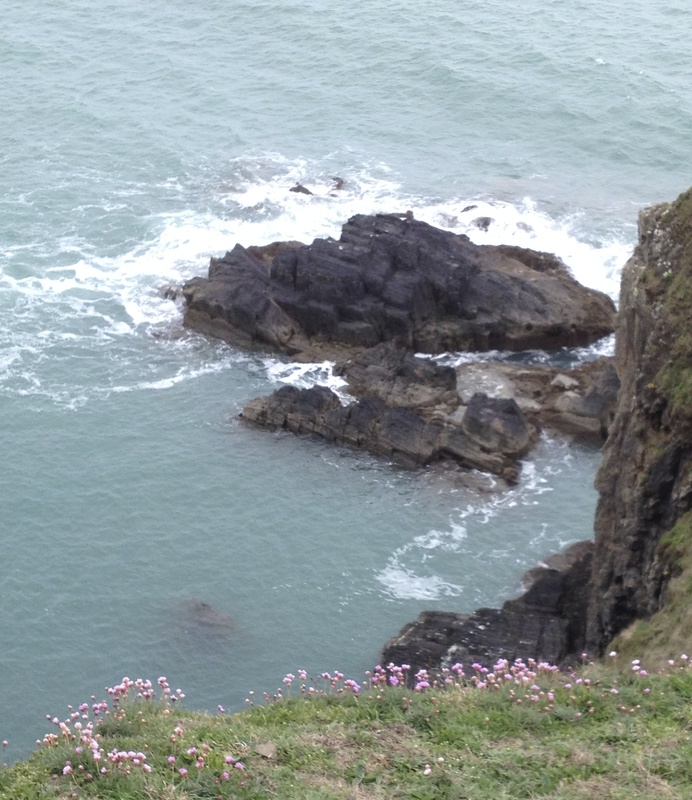 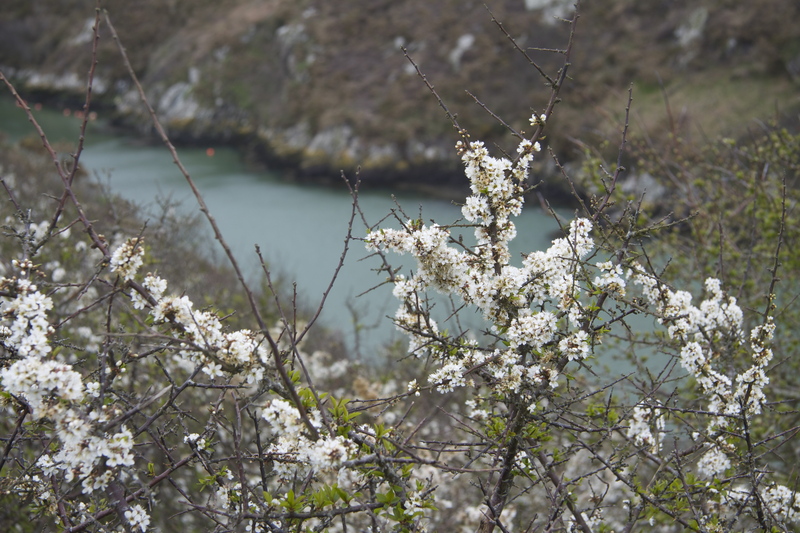 It has been a dazzling April – except for today when I set off for a walk in my navy blue fur coat and return ridiculously soaked and bedraggled like a cartoon dog who has been up to no good. 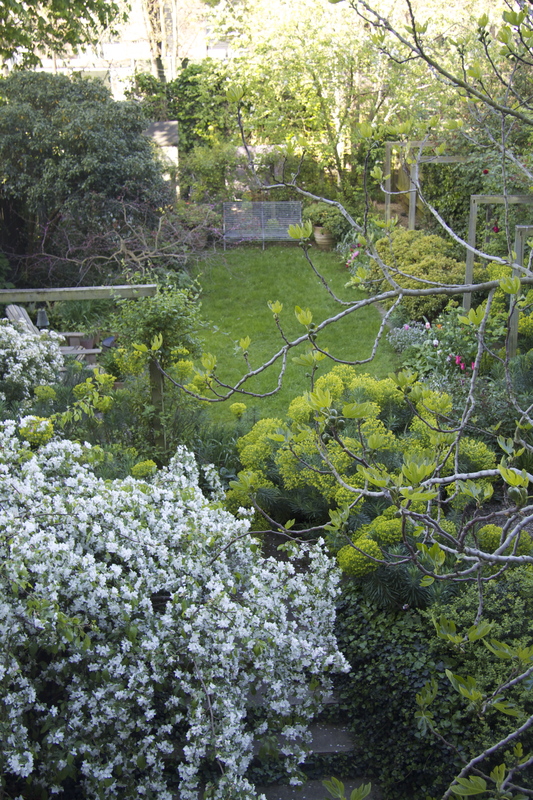 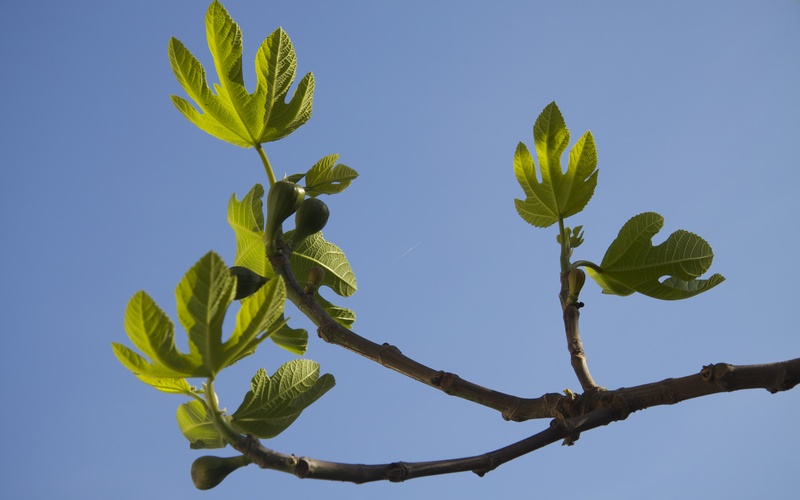 Every morning I have been watching the sun creep over the back fence of our garden in South London and feeling as the day goes on that I can see the plants growing before my very eyes. 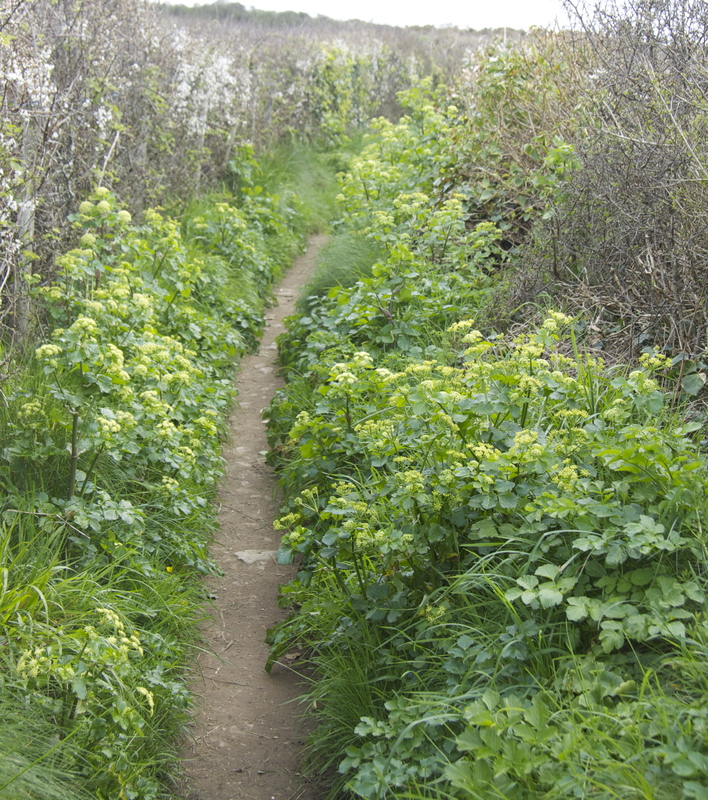 Much of the way is lined with cow parsley – I love this moment when the cow parsley is still tight and yellow-green and you get that first-snatched taste of the lacy fullness to come. 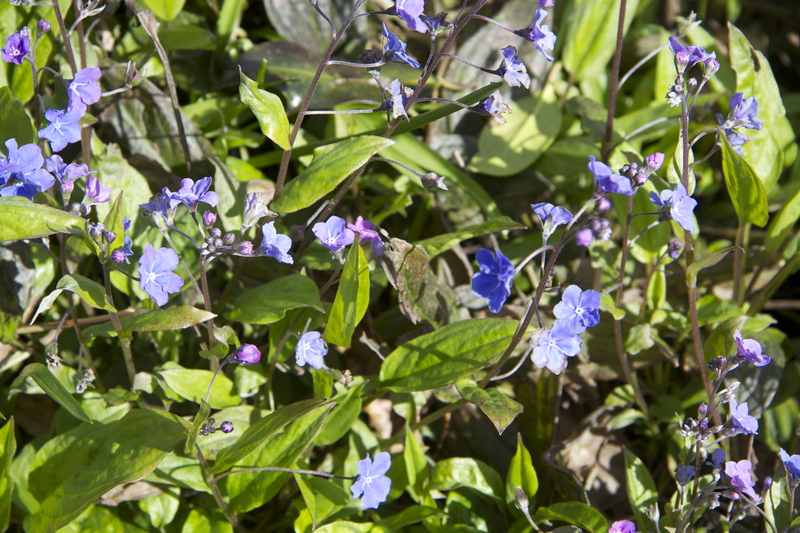 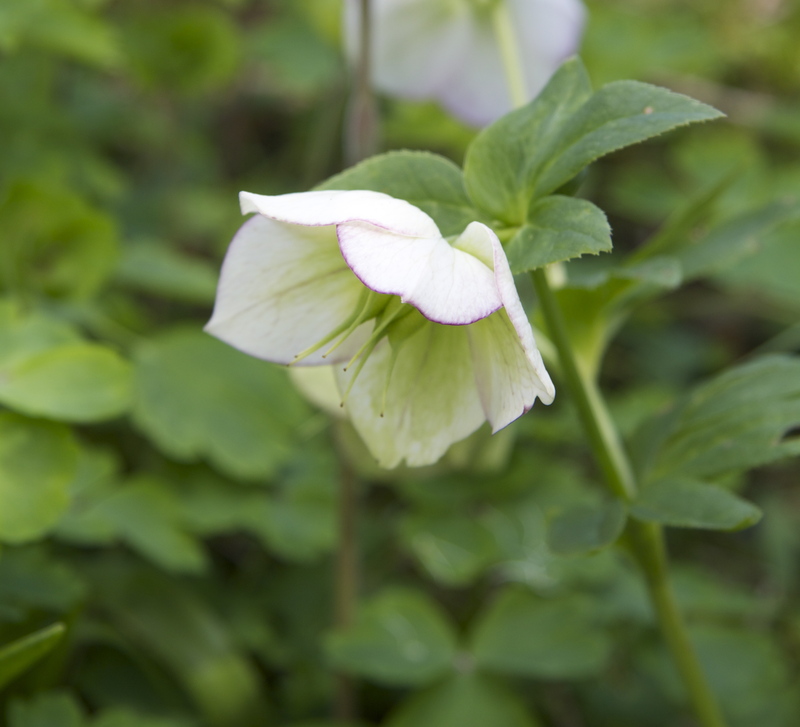 The expression ‘shrinking violet’ was first used to describe the violet’s modesty by Victorian essayist Leigh Hunt. 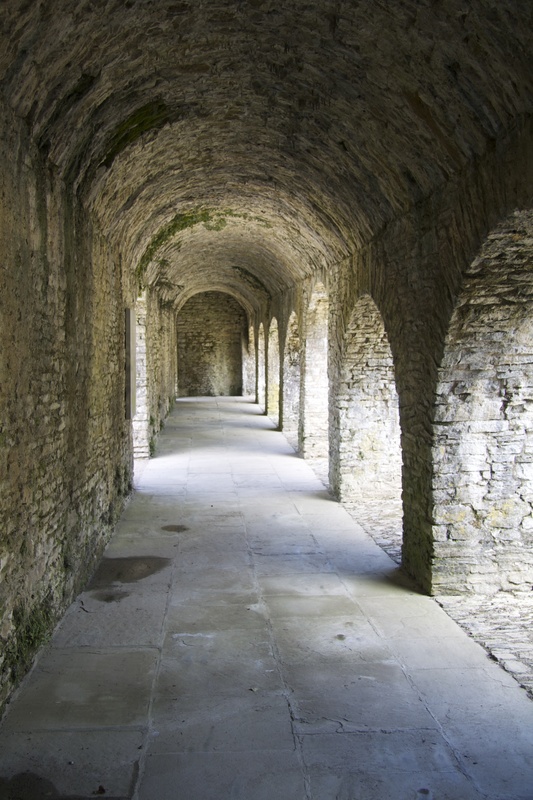 It was quickly taken up as an expression to describe a quiet, even introverted personality. 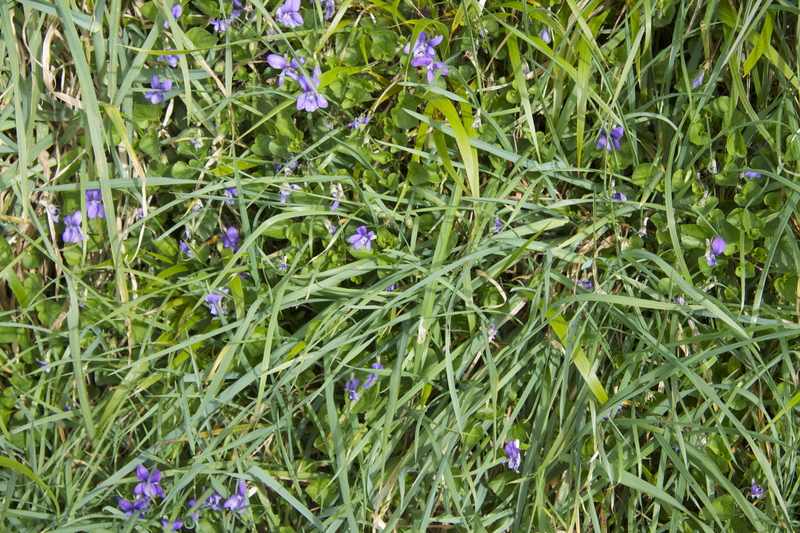 On this walk I am fascinated at the way the flowers take such pains to lurk behind other foliage – and I cannot get the image of Dash’s gawky teenage sister hiding shyly behind a curtain of hair in the brilliant INCREDIBLES movie out of my head. 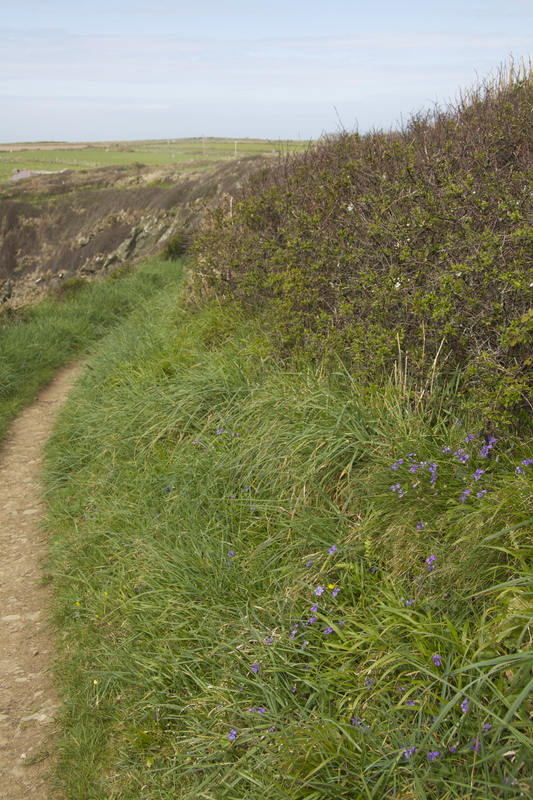 Only when I get home and look her up am I reminded that the character is course perfectly named, Violet! 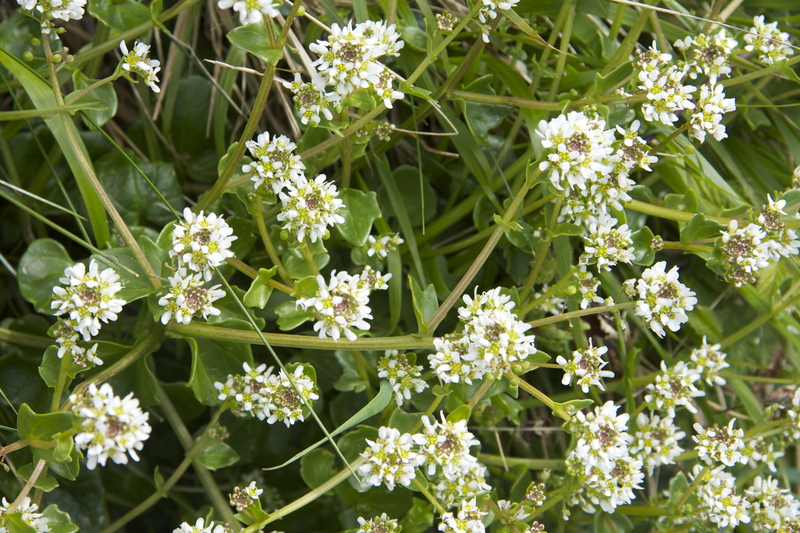 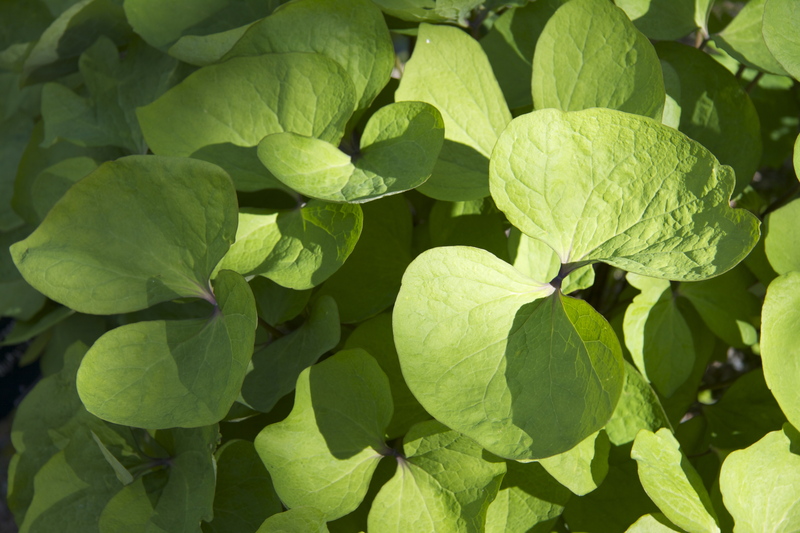 – its leaves full of Vitamin C, traditionally much valued by sailors as a protection against scurvy. 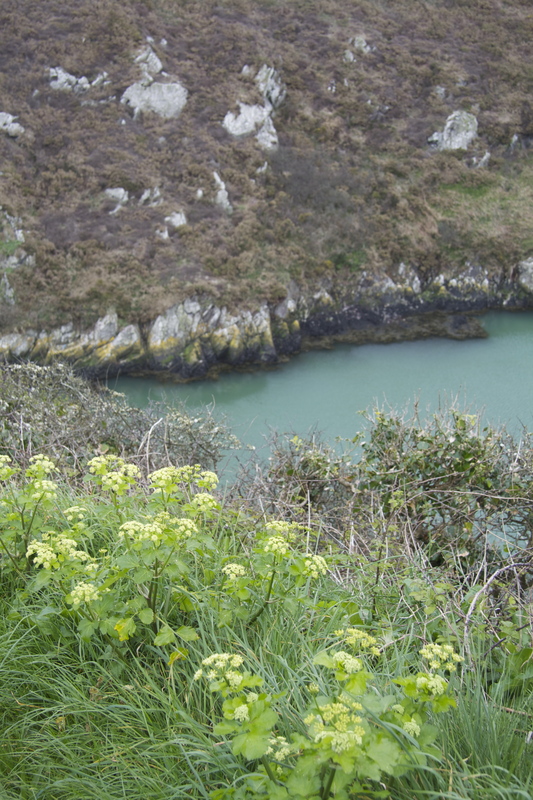 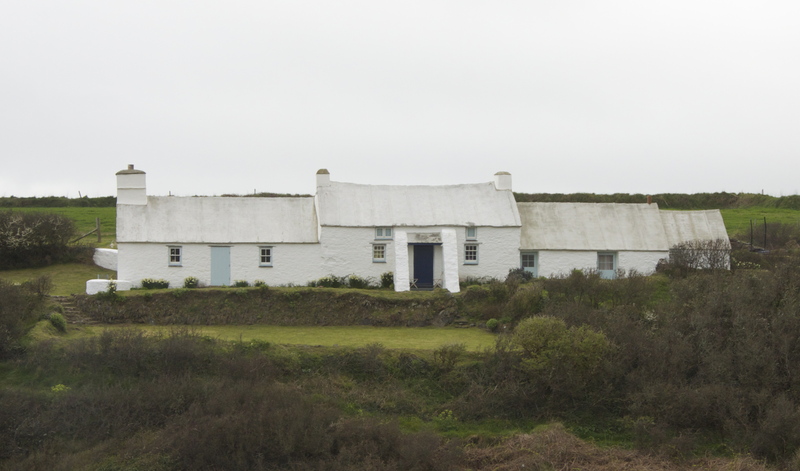 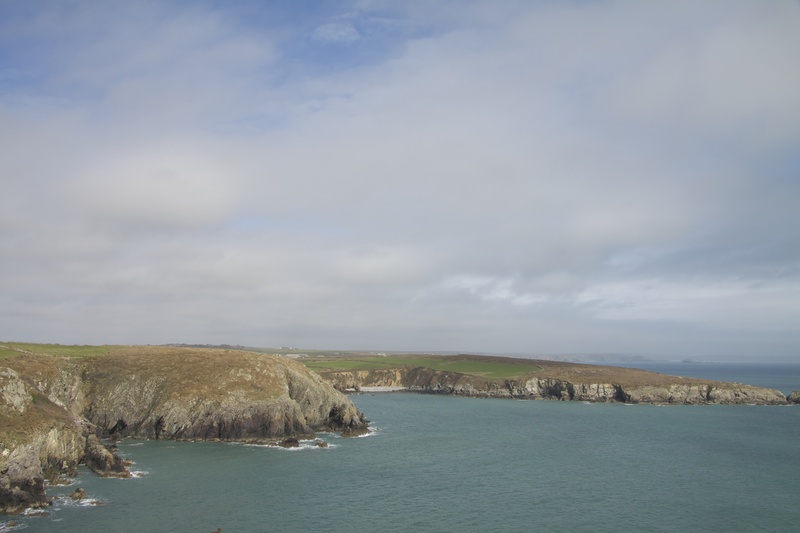 By the time I see this blocky, white-washed, cliffside farmhouse I am ready to move in and create a seaside garden of my own, planting it very simply but generously with the sort of plants that have we have just walked past. 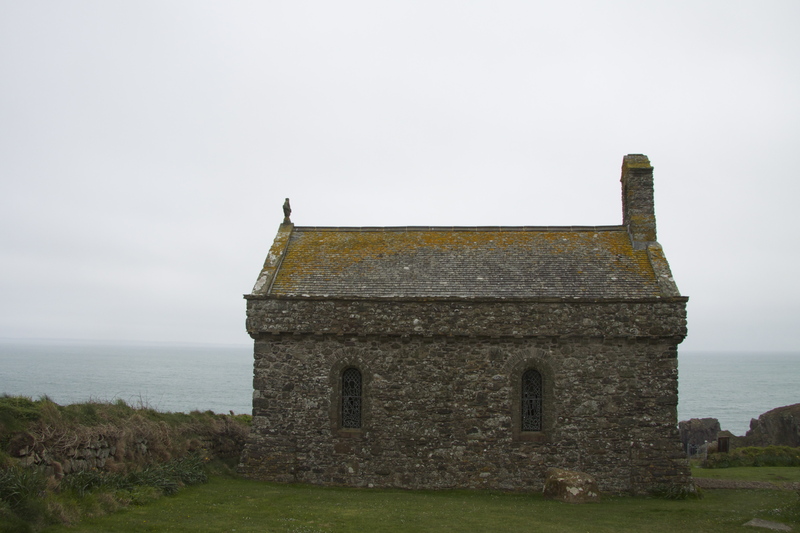 At the end of our walk stands the 1930’s chapel of St Non – a notice tells us that church services are no longer held here as when the rain beats against the chapel it can penetrate the two and a half feet walls in less than thirty minutes. 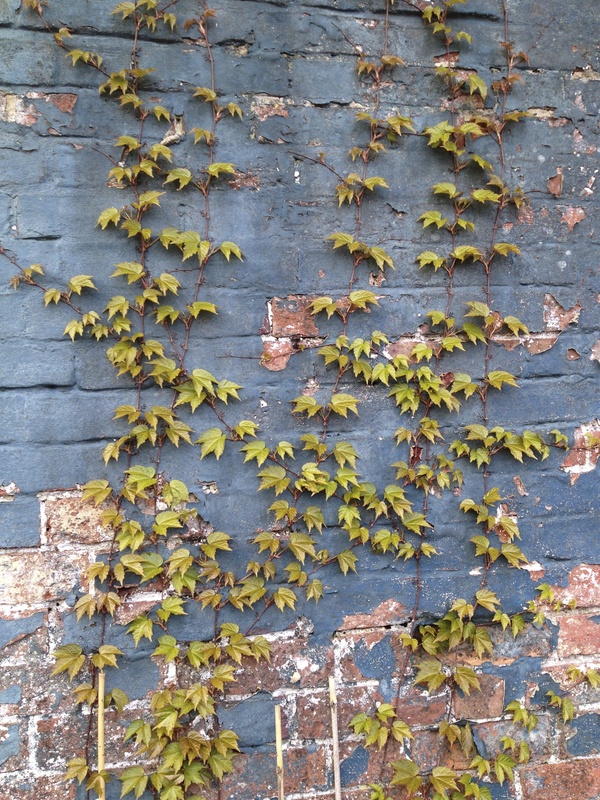 that make you want to stop and look closer: and closer still. 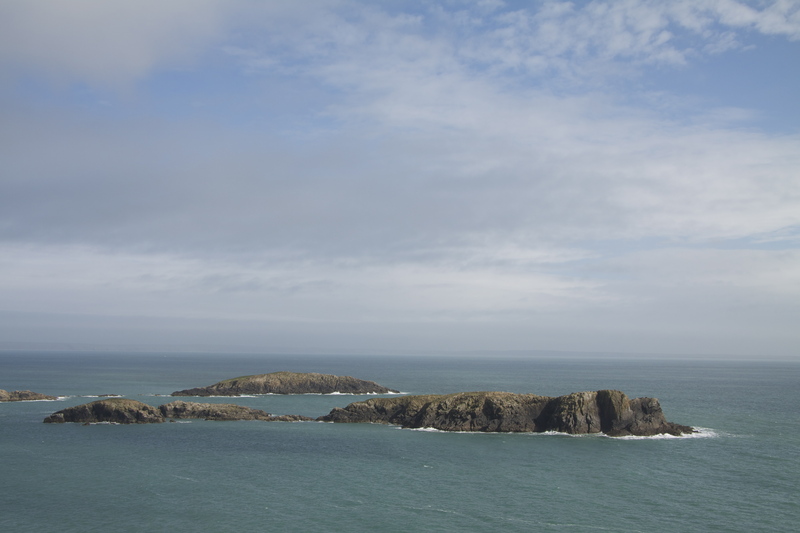 This is real Wales to me. 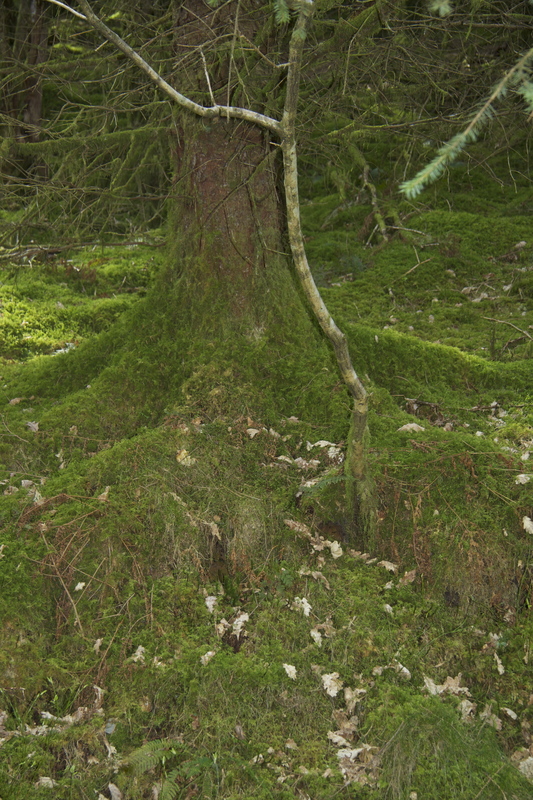 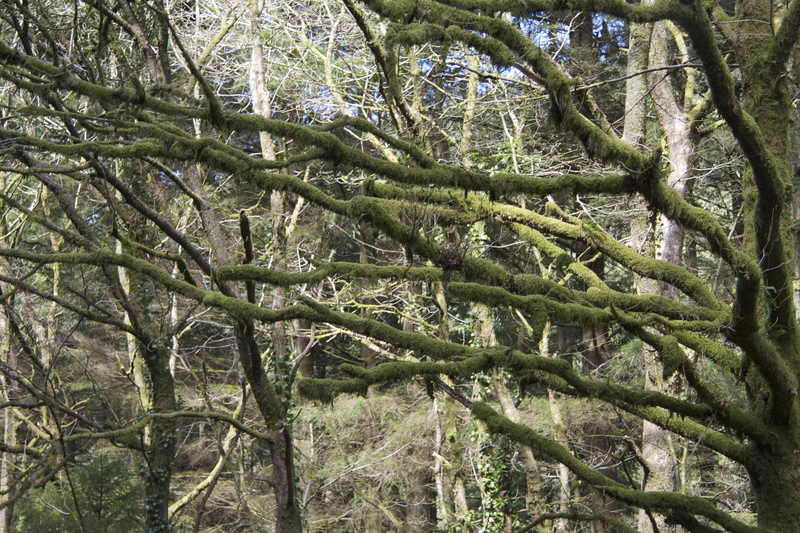 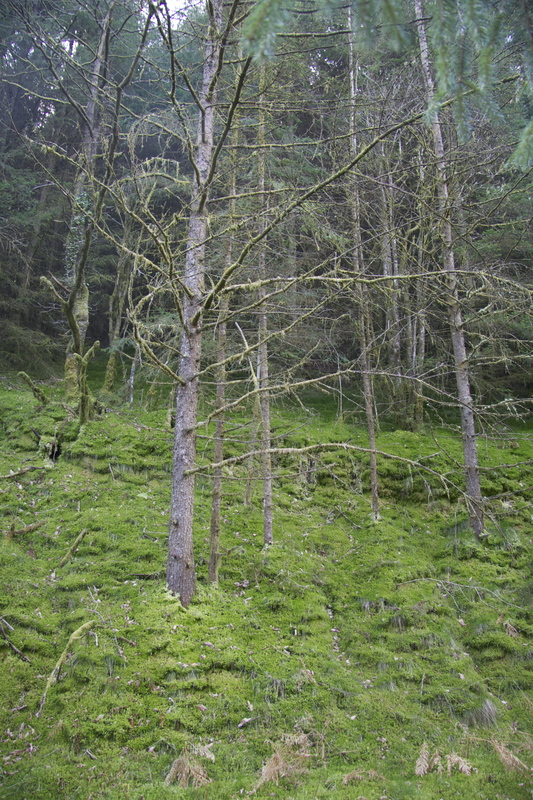 We amble through the forest before lunch on Sunday and I feel rooted and cushioned by our visit. 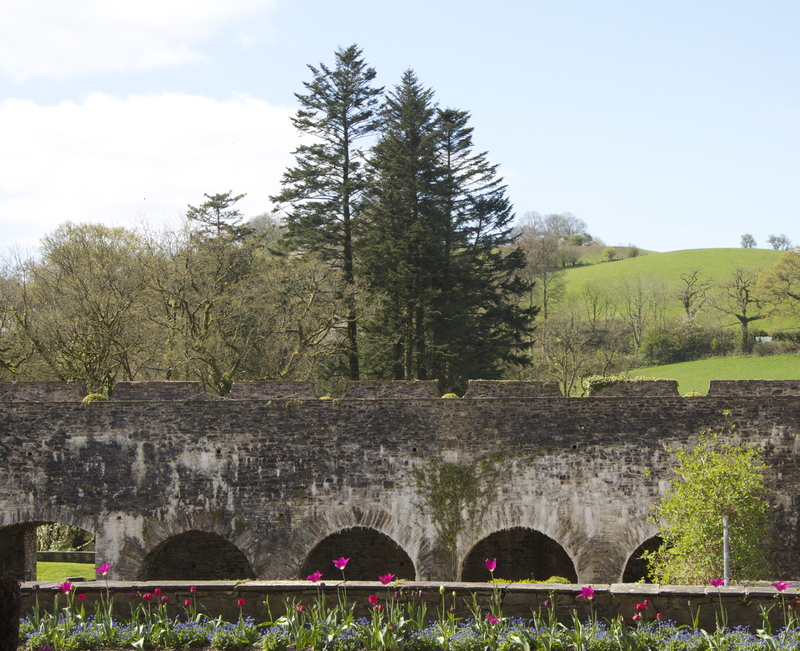 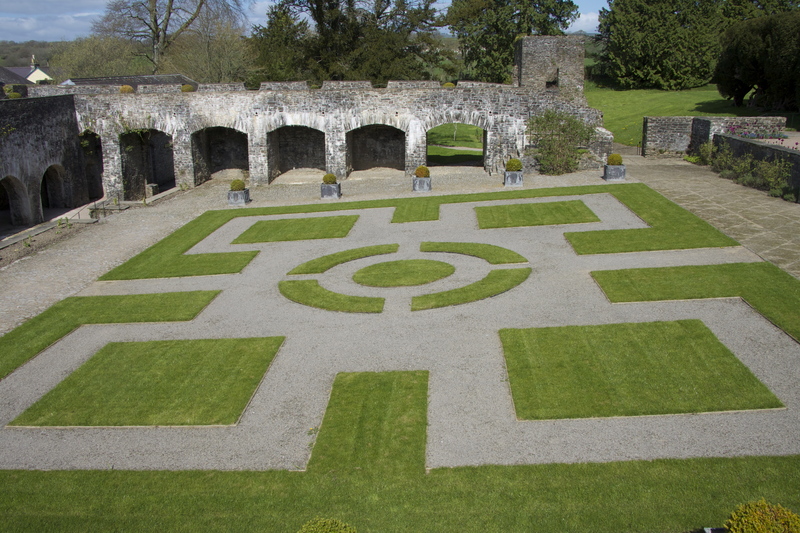 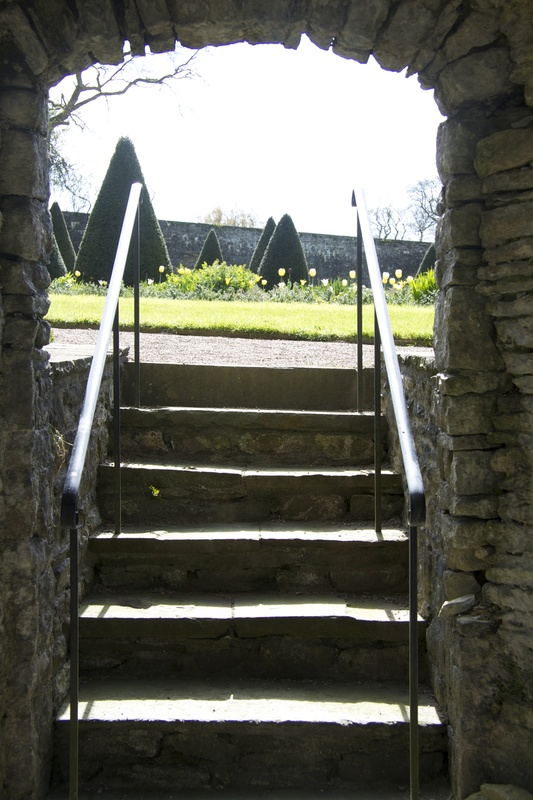 On the way back to London, still in Carmarthenshire, we visit the restored medieval gardens of Aberglasney. 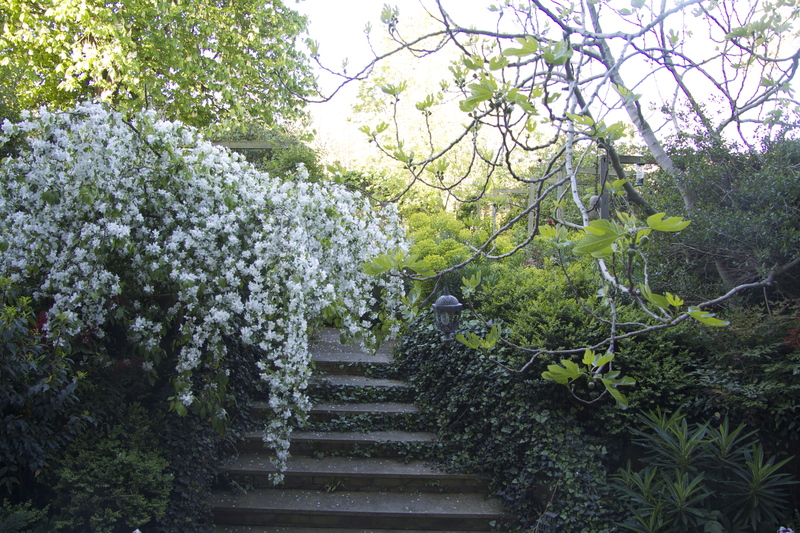 The perfection of the immaculately gardened grounds is occasionally overwhelming but there are some very beautiful elements and as always ideas to try to take away. 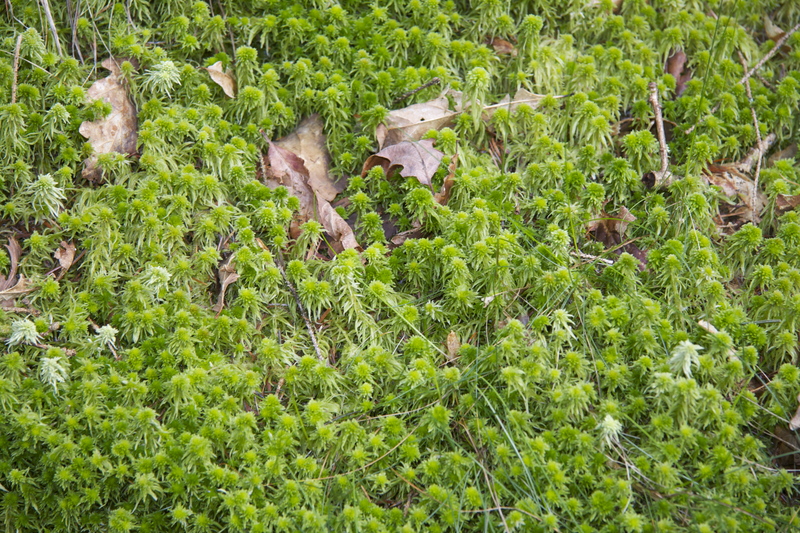 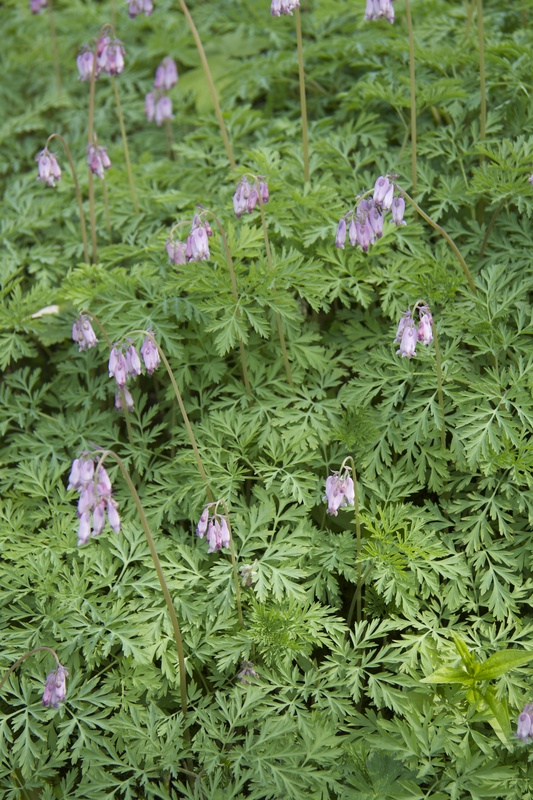 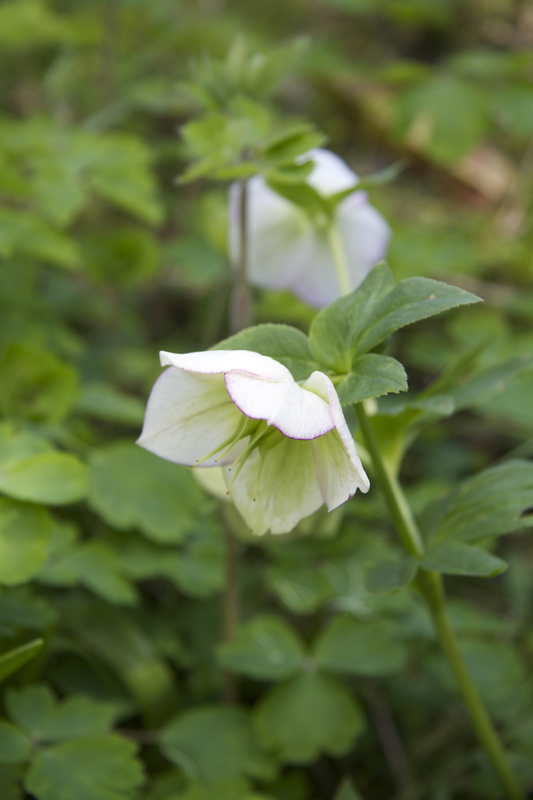 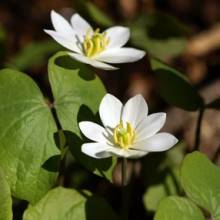 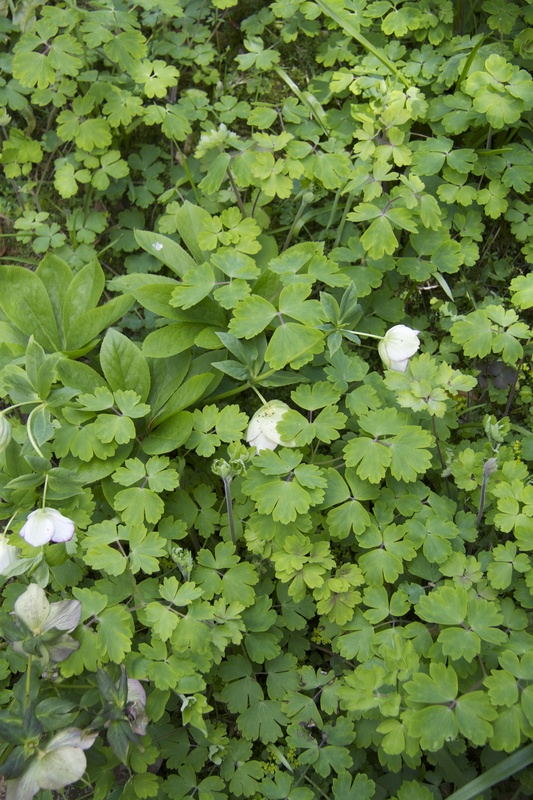 This North American woodland plant has wonderful rounded bow-ties of bright green leaves and will bear bowl shaped anemone like white flowers later in the month – available to buy in the UK from Long Acre Plants, a great nursery which specializes in plants for shade. 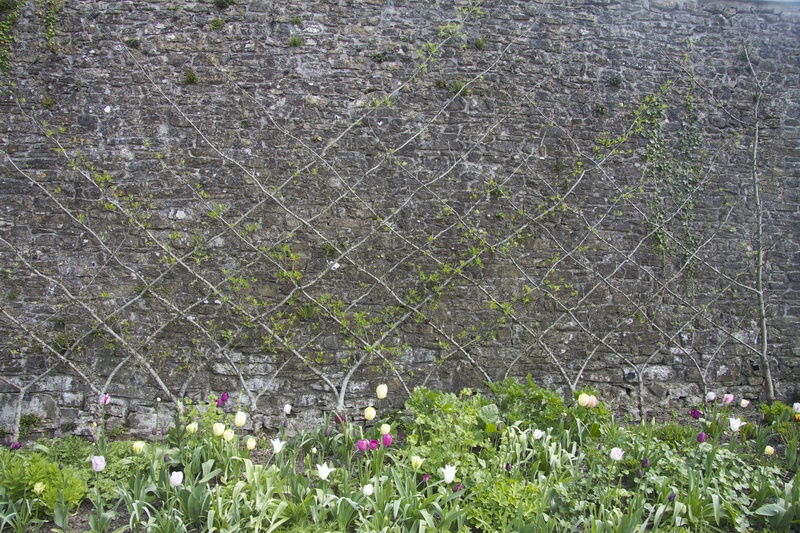 And then there are the beautiful bones of the garden, old stone walls which are wonderfully exploited in different ways throughout. 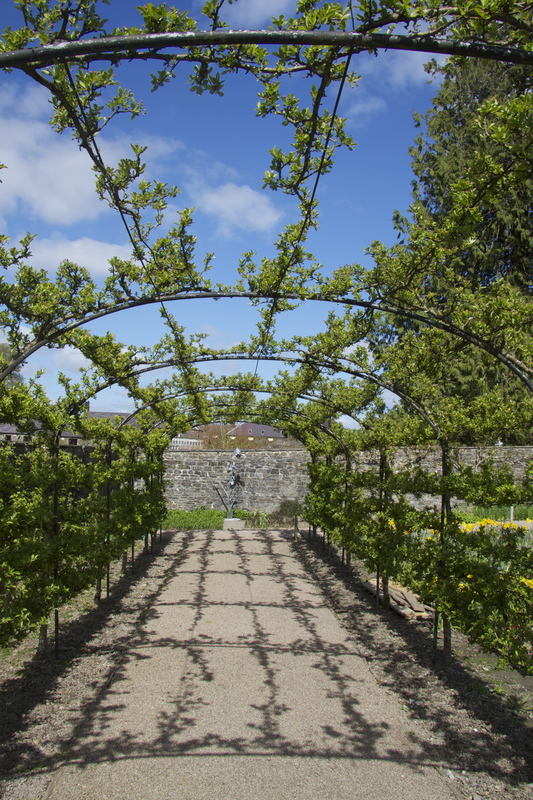 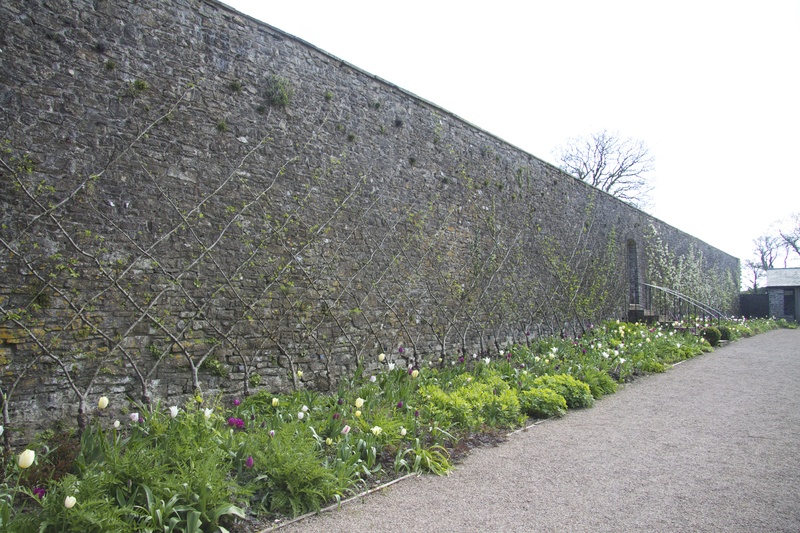 Here the handsome crenellated wall provides a strong structural shape to balance the mature trees beyond and acts as a backdrop for the brightly coloured bedding in front. 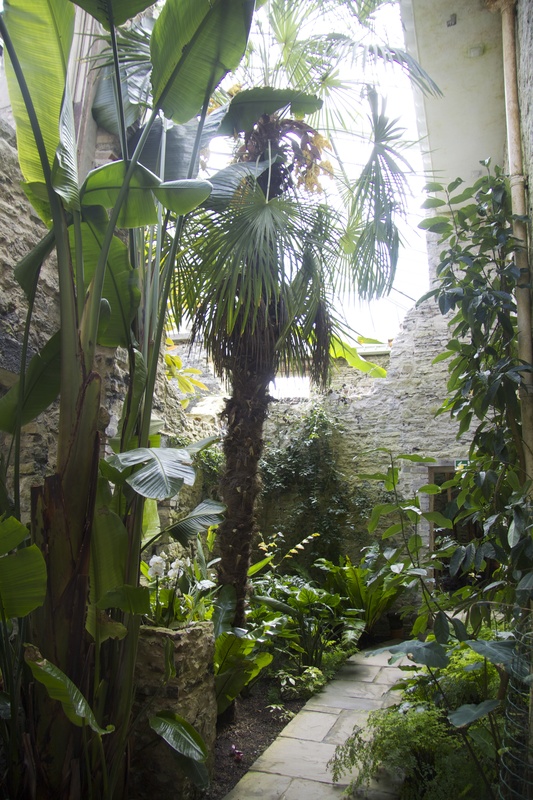 Where the walls are clothed in plants the approach is simple and uncluttered. 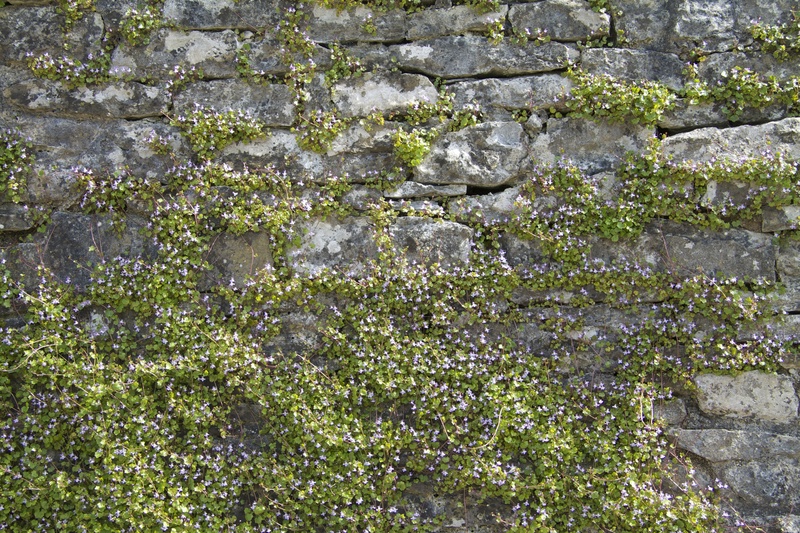 There is an entire wall of ivy leaved toadflax (Cymbalaria muralis) – a delicate trailing plant with tiny ivy-like leaves and lilac flowers ‘like tiny snapdragons’ ( turn to Chiltern Seeds if you would like to recreate the look) all summer. 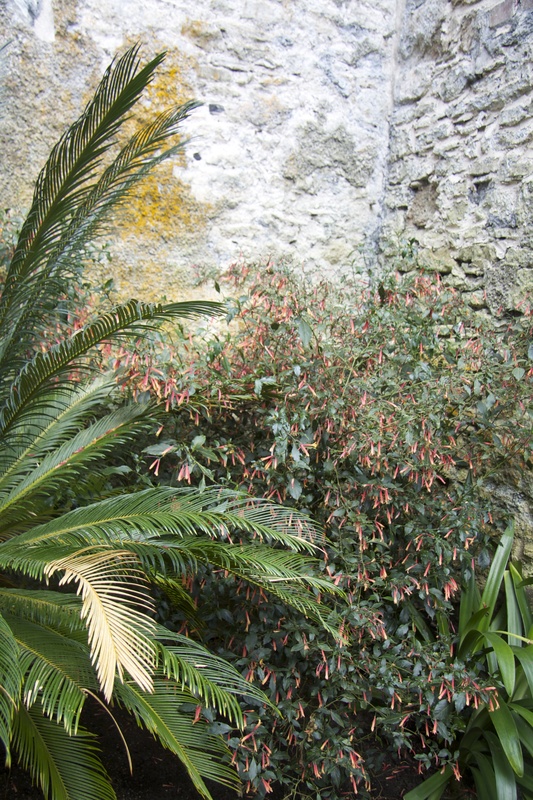 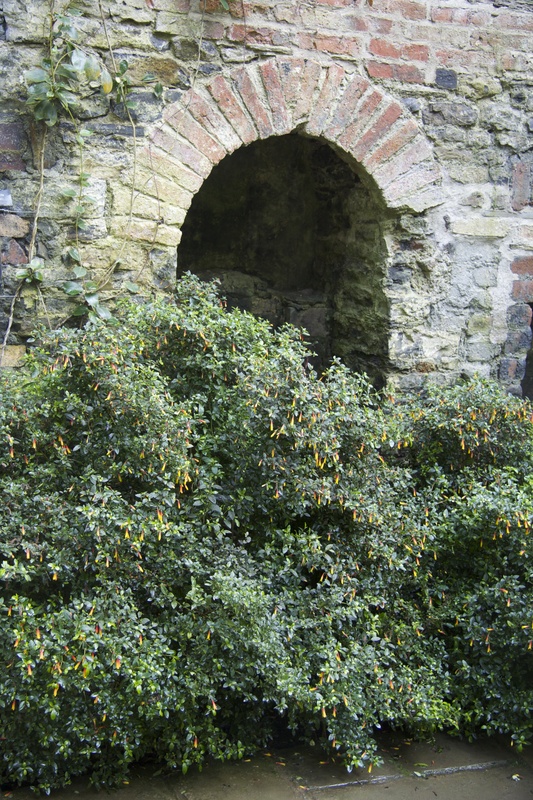 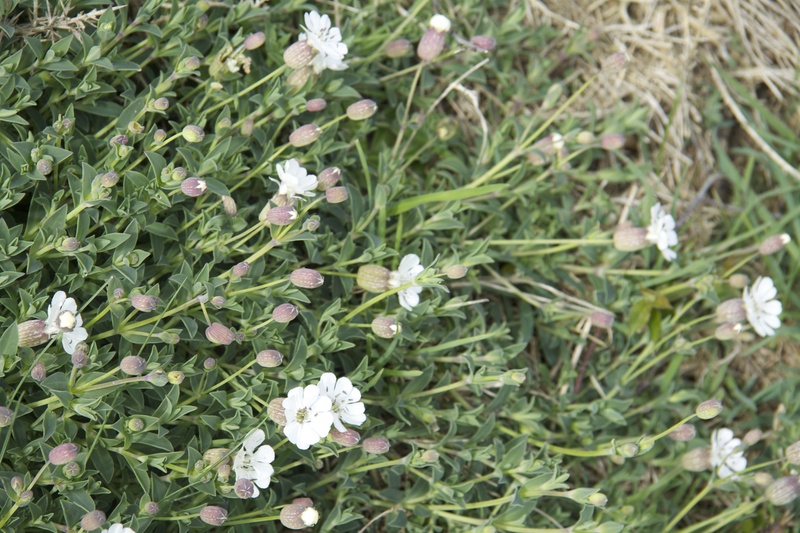 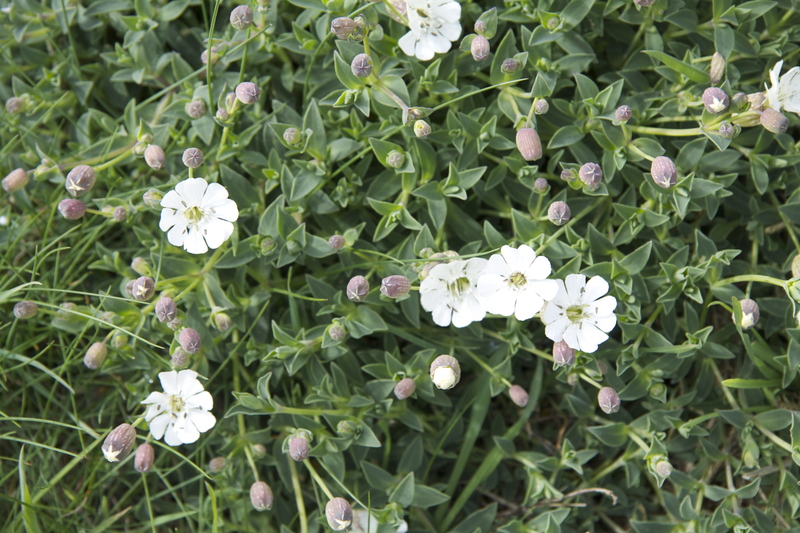 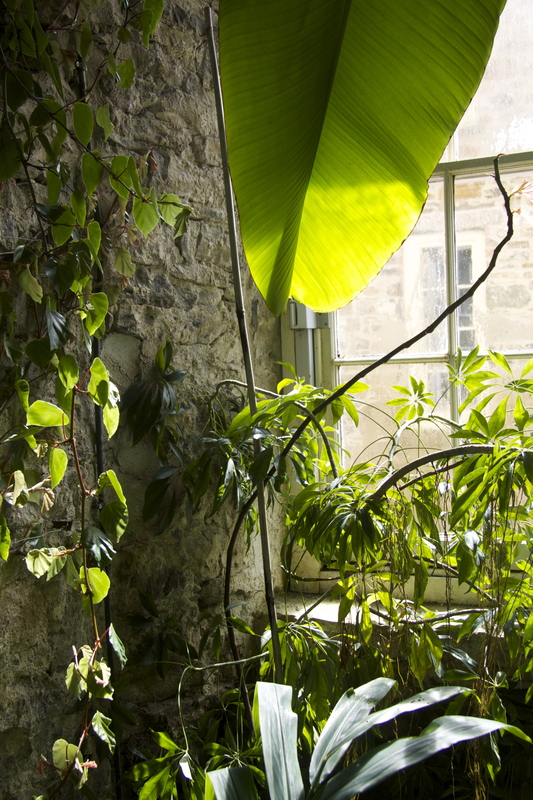 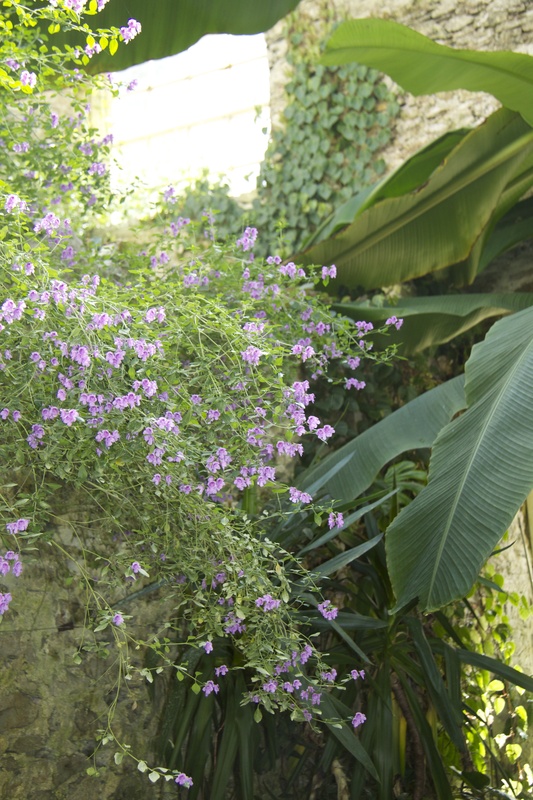 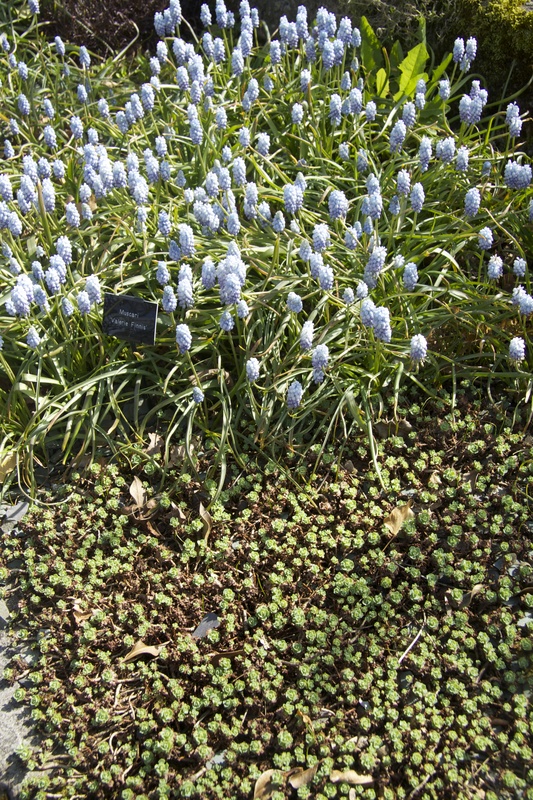 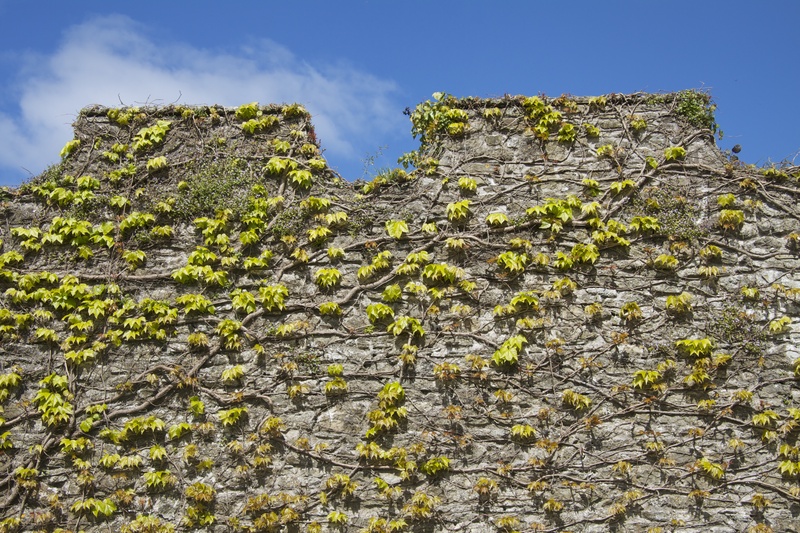 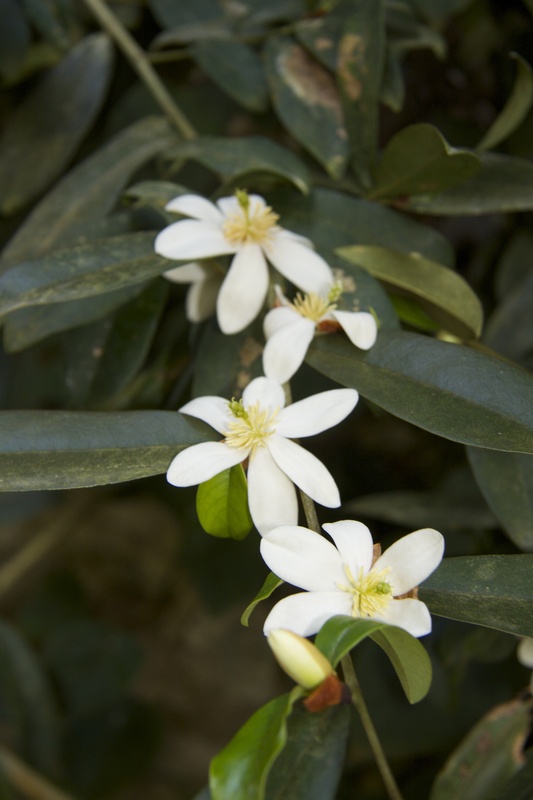 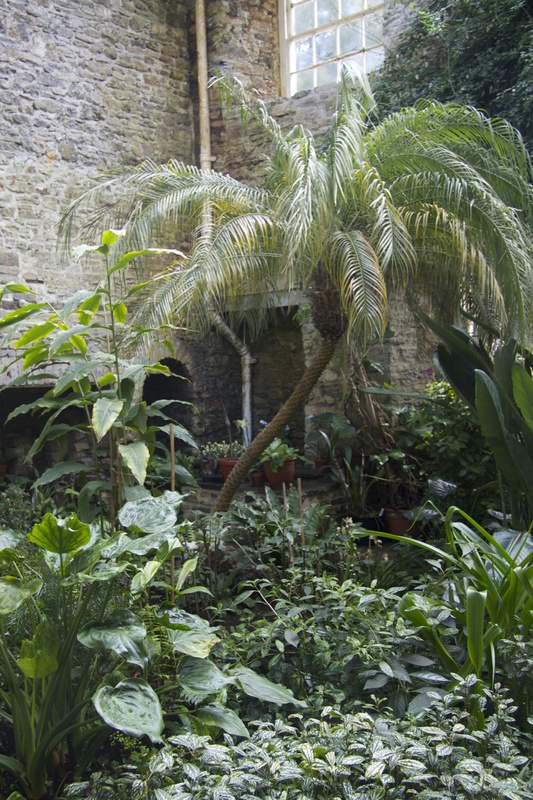 This plant was introduced to the UK from Europe in the Seventeenth Century and is perfect for growing in crevices and on walls to create a soft atmosphere in a new wall. 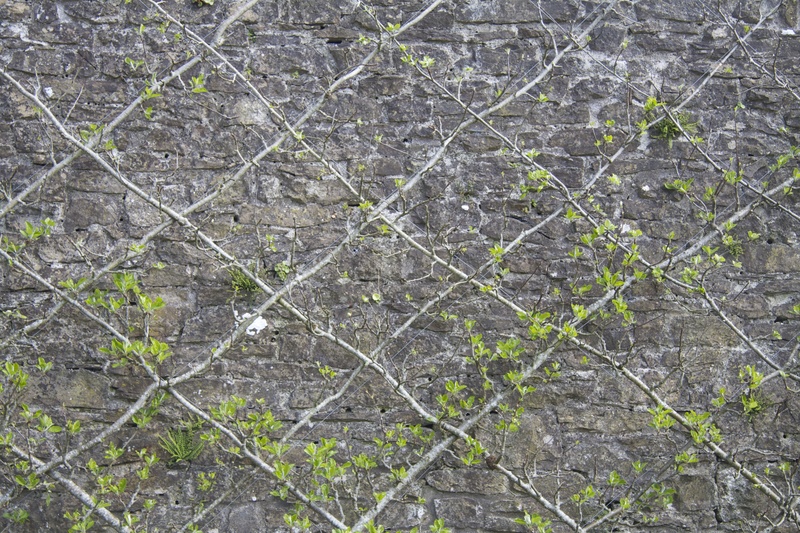 There are further crenellated walls elegantly laced with stems of Virginia creeper – again I am moved by this moment in the year when you can almost see the new leaves growing, trying to cover the wall completely. 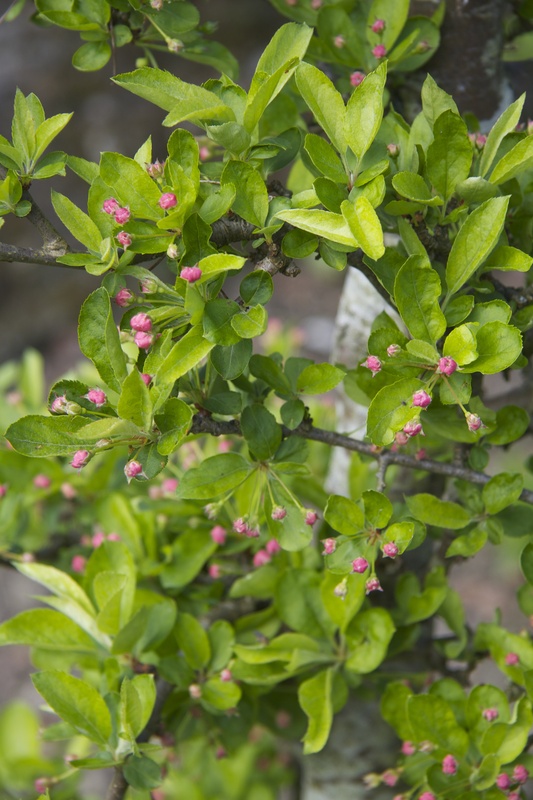 The crab apple used here is the compact and particularly broad variety, Malus sargentii, which has a profusion of long-lasting neat cherry-like red fruit from August onwards. 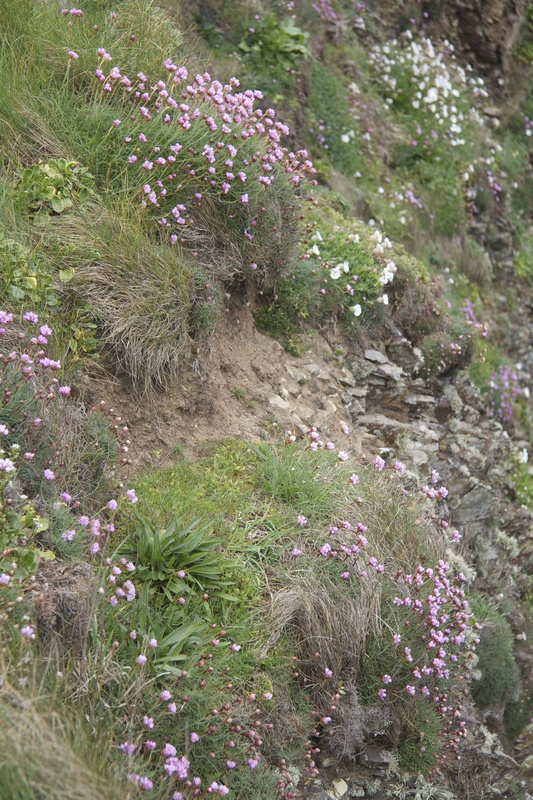 The neat pink buds will open to white and the tunnel should be in full flower by the end of April/beginning of May. 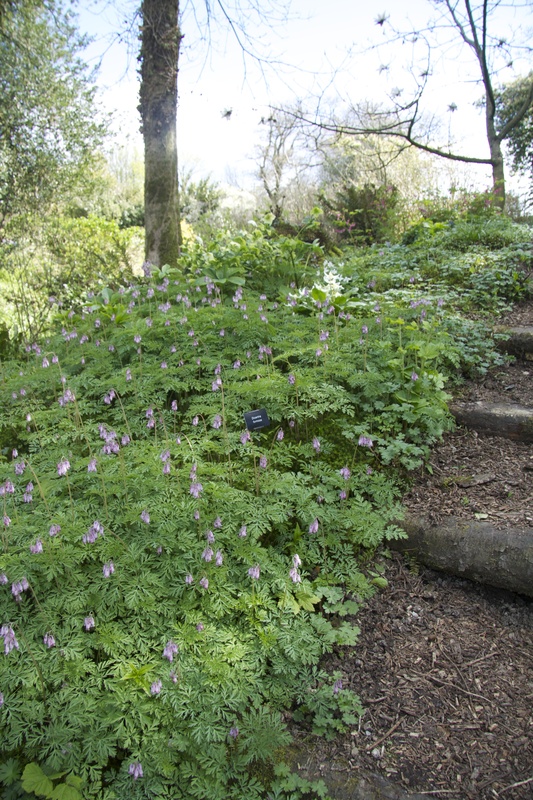 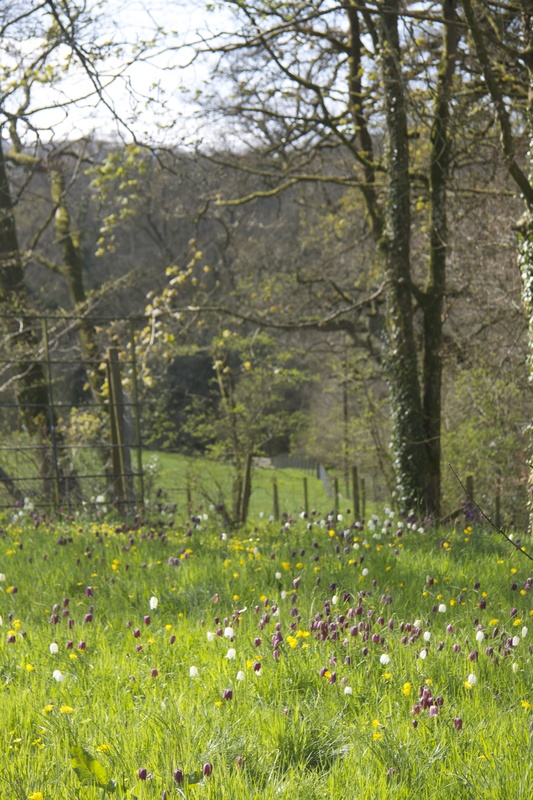 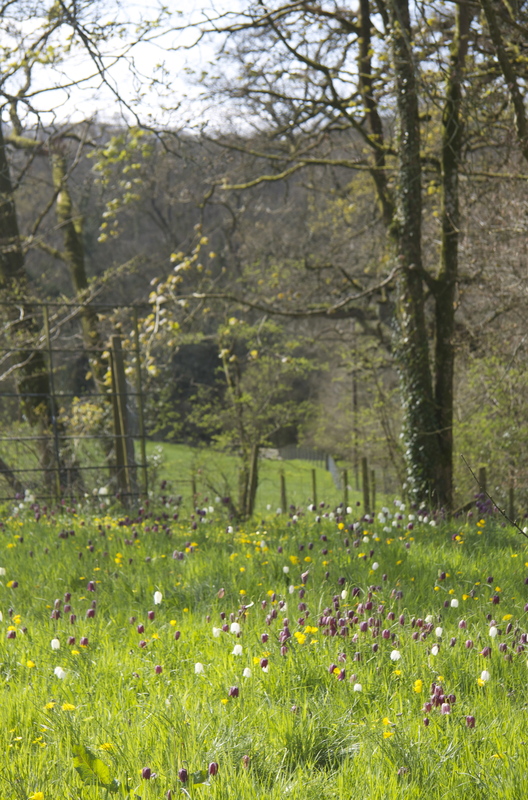 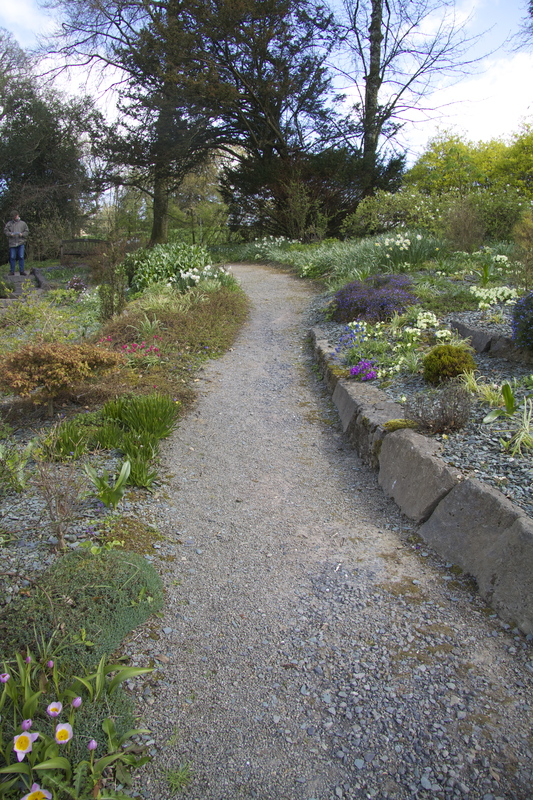 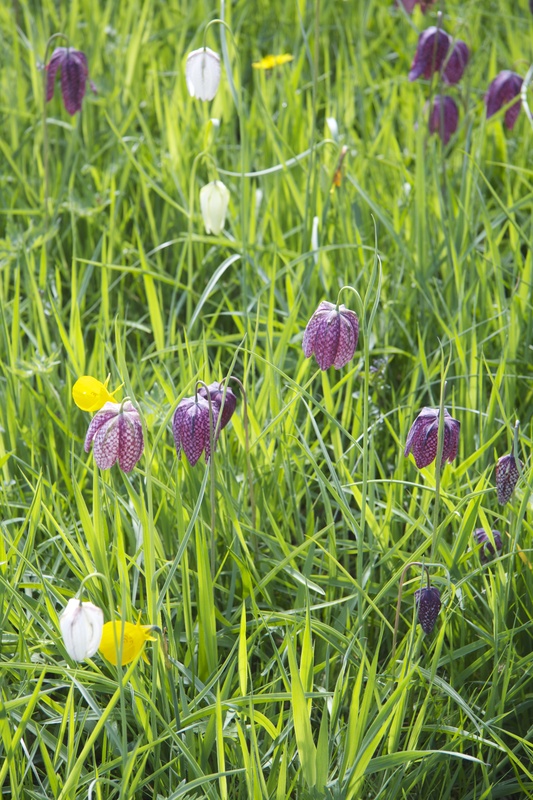 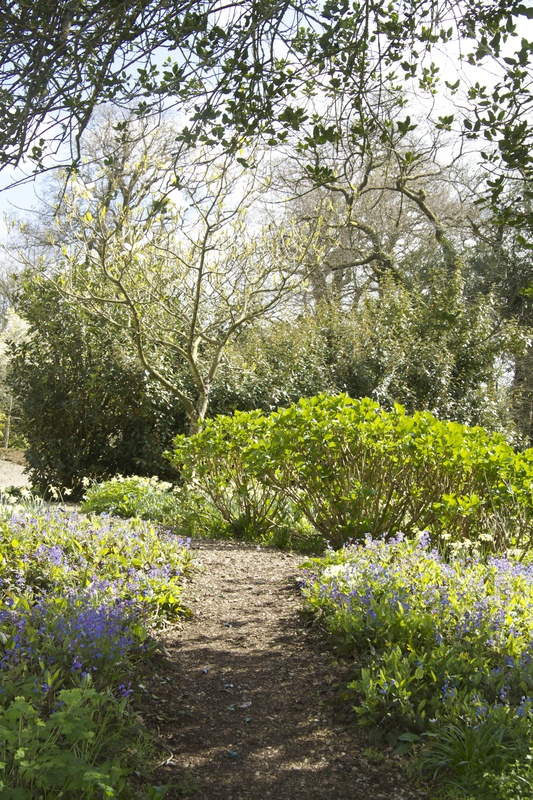 This entry was posted in Gardens and tagged Aberglasney, Armeria maritima, Belgian Fence, Blackthorn, Cochlearia officinalis, Common Scurvygrass, cow parsley, Cymbalaria muralis, Dicentra formosa, Fig, Fritillaria meleagris, Helleborus orientialis 'Harrington Double white Speckled, ivy leaved toadflax, Jeffersonia diphylla, Long Acre Plants, Malus sargentii, Muscari Valeri Finnis, Ninfarium, Omphloides cappadocica 'Cherry Ingram', Parthenocissus quincequefolia, Pembrokeshire Coastal Path, Prunus spinosa, Sea Campion, Silene uniflora, snakeshead fritillary, St Non's Chapel, sweet violet, The Incredibles, Thrift, viola odorata, Violet, Virginia Creeper, Wildflowers, William Morris on April 20, 2014 by nonmorris. 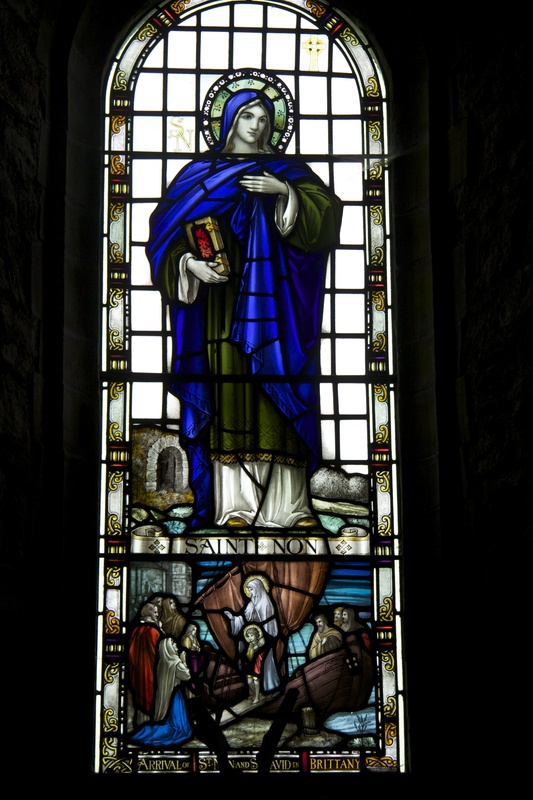 I had no idea there was a chapel of St Non – poor her, being soaked through by determined Welsh rain so relentlessly over the years. 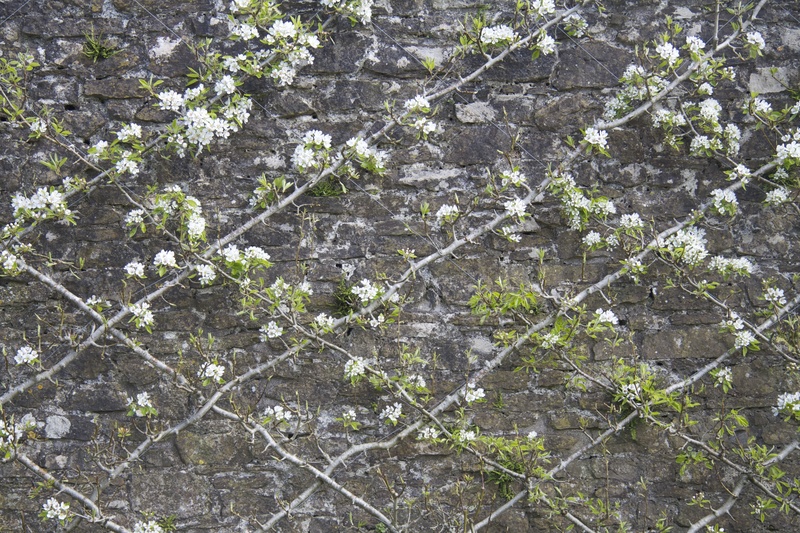 In fact, I’ve learned many things from this post, not least of which is that such an intricate interweaving of fruit trees is called a Belgian Fence. 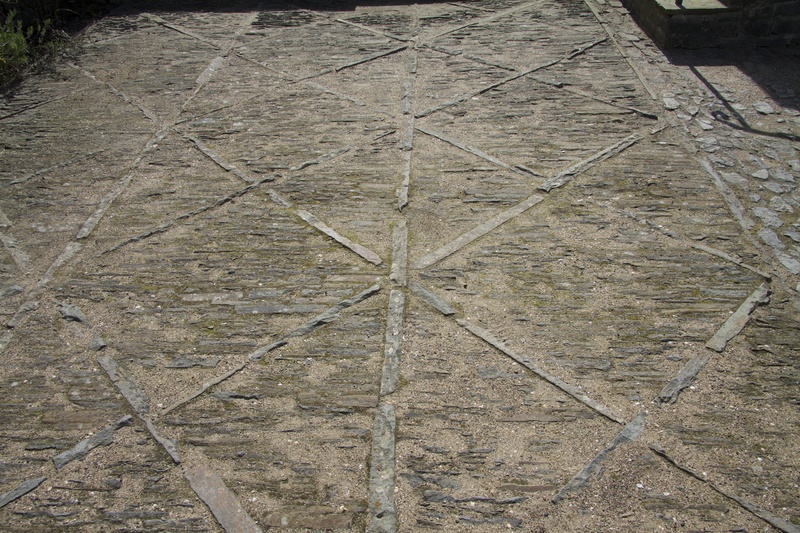 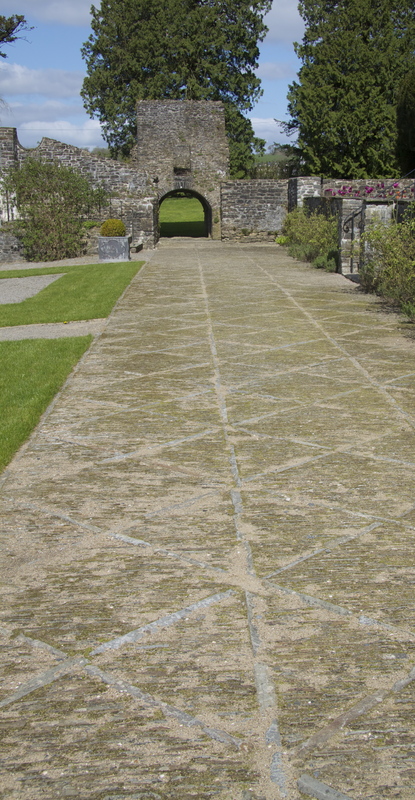 It’s presumably no accident that the magnificent pathways are cobbled in an identical pattern. 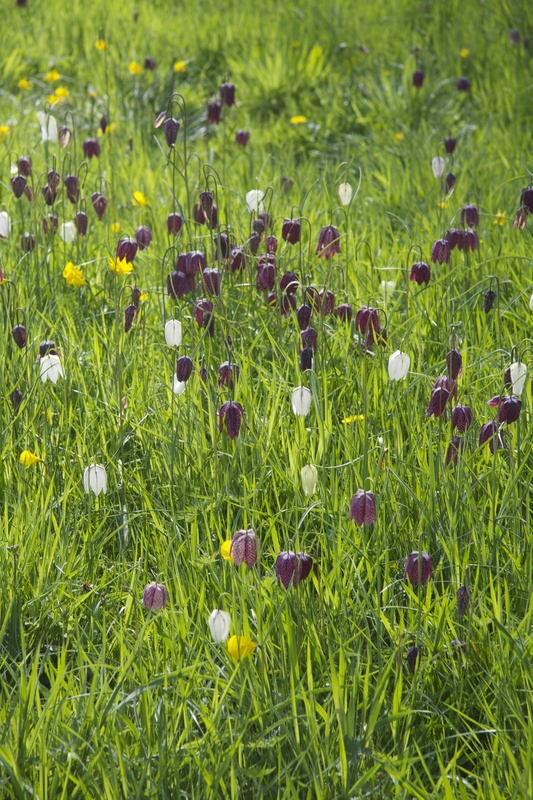 And I do love the phrase ‘successional planting’. 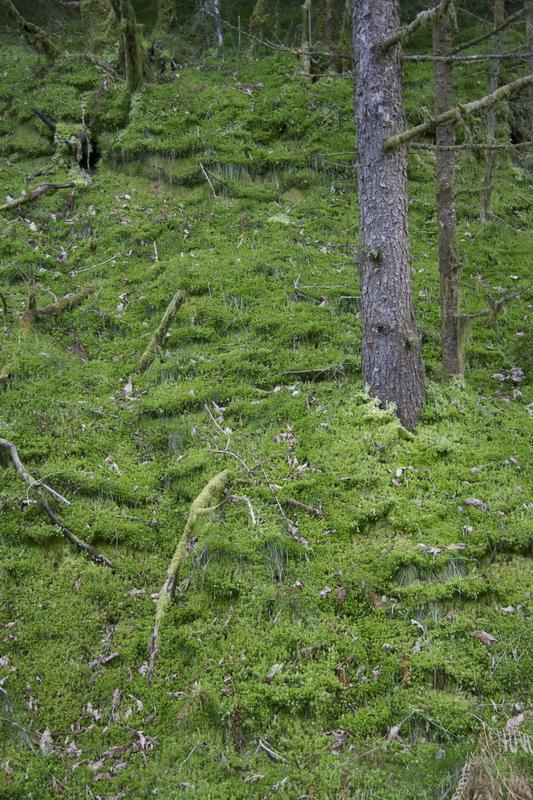 All in all, I know far more now than I did when I started reading your wonderful post.